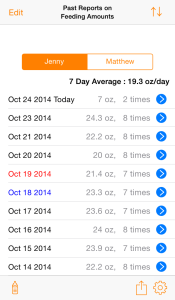 Simple Baby Feeding Log | Little Grass Inc. This is a guidance page on how to use this app. For questions and concerns, please click here. published on the AppStore in various countries. Let us know how we can make this app more fun and easier to use. Are there any features you’d like to see? The “Daily Report Screen” will appear. The “Past Reports Screen” will appear. 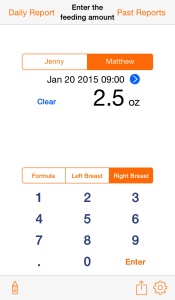 If several babies are registered, tap one of the babies to enter a nursing amount. If you want to specify the time and date of breast-feeding, tap this icon. The input value is cleared to zero. 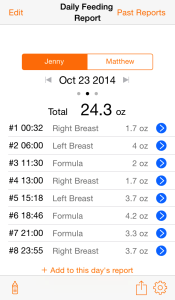 Tap the type of nursing you’re inputting. 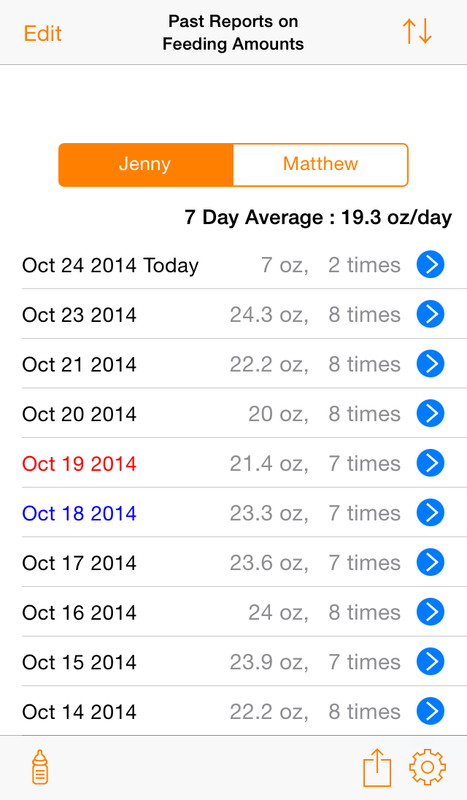 By registering the value that you’ve entered with the number buttons, the “Daily Reports Screen” will appear. When you tap this screen, the time and date goes to the most recent and the breast-feeding amount value is cleared to zero. 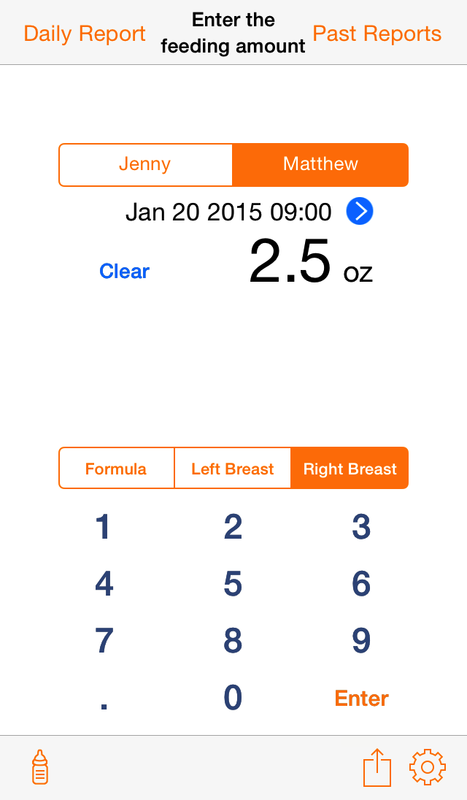 Tap to export or share (input and output) the breast-feeding data that was entered. The “Send Email Screen” will appear. Output to a text file (CSV format). The output file can be retrieved with a PC or by sharing it on Mac’s iTunes. The “Import File Selection Screen” will appear. 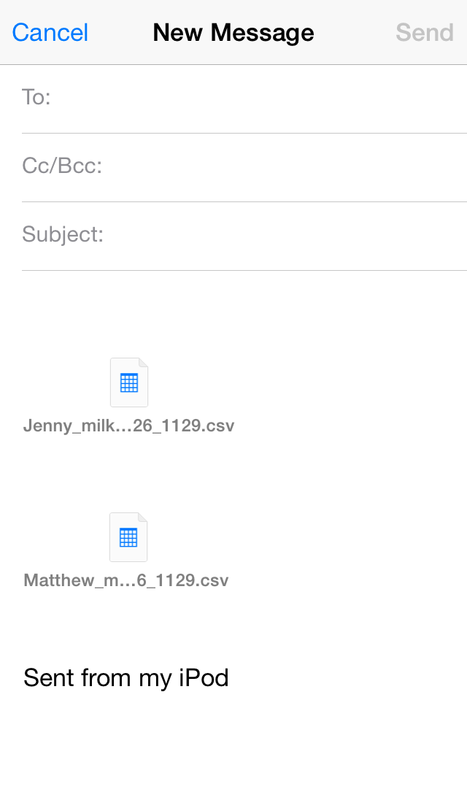 Select the outside file that you received and you can incorporate it into the app. 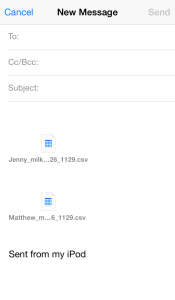 The file format is a text file (CSV format). In order to receive a file, you can either use Mac’s iTunes file sharing or a PC. It can be received by email or another iOS app. 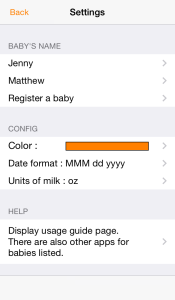 Select “Simple Baby Feeding Log” from the list of data. The “Settings Menu” will appear. Select the input records from a list and they will be deleted. If more than one baby is registered, tap the baby whose records you want to view. A list for the previous days will appear. You can even swipe from left to right in the same manner. A list for the next days will appear. You can even swipe from left to right in the same manner. Today will not be displayed. 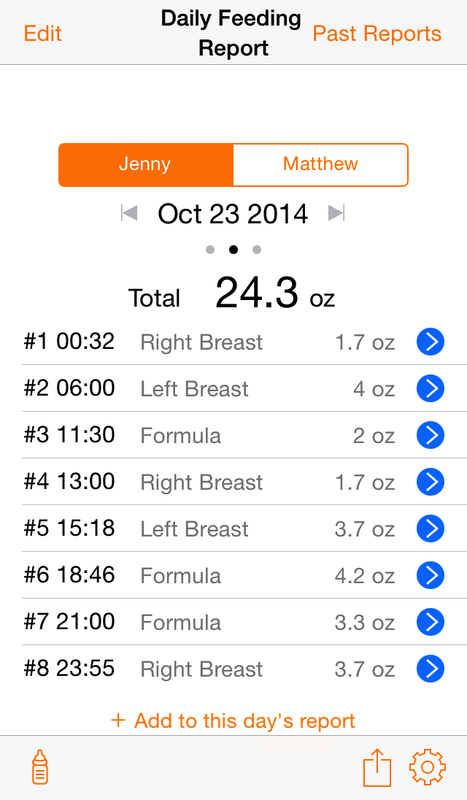 Tap the “Edit Breast-feeding Records Screen” for it to appear. The “New Input Screen” will appear with the date you’re viewing. The “New Input Screen” will appear with the tapped date and time. Select from a list of input records and delete or delete a previous record with a specified date. The order of the displayed list will reverse. If you tap it again, it will return to its originally displayed order. Tap the “Daily Report Screen” for it to appear. The “Edit Baby’s Name Screen” will appear. You can edit the baby’s name or remove the baby’s registration. The “Add Another Baby Screen” will appear. You can register a baby’s name. The “Color Settings Screen” will appear. You can select the application’s base color. The “Date Format Settings Screen” will appear. You can select from the following formats. 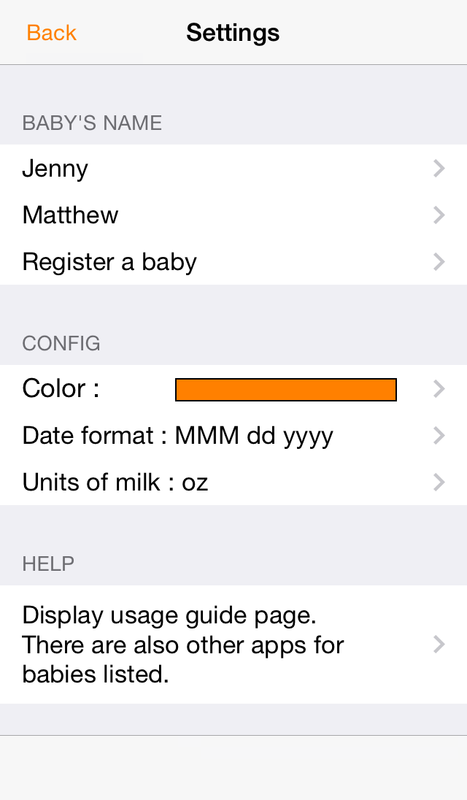 The “Units of Milk Settings Screen” will appear. You can select from the following units. Files that can be imported are listed. Return to the previous screen. Select from a list of files and delete. 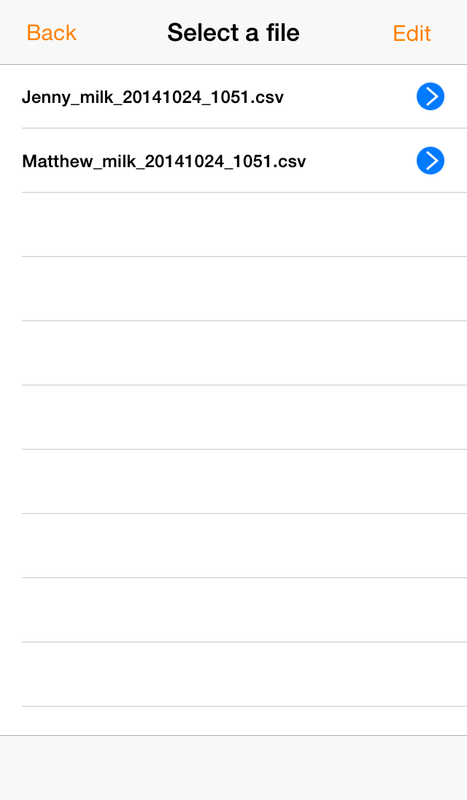 When you tap the file name, the “Import Content Confirmation Screen” will appear. If there are no problems, then the file will import with the “Import” button. ※ If the import is the same baby’s data that is already there, it will be added. 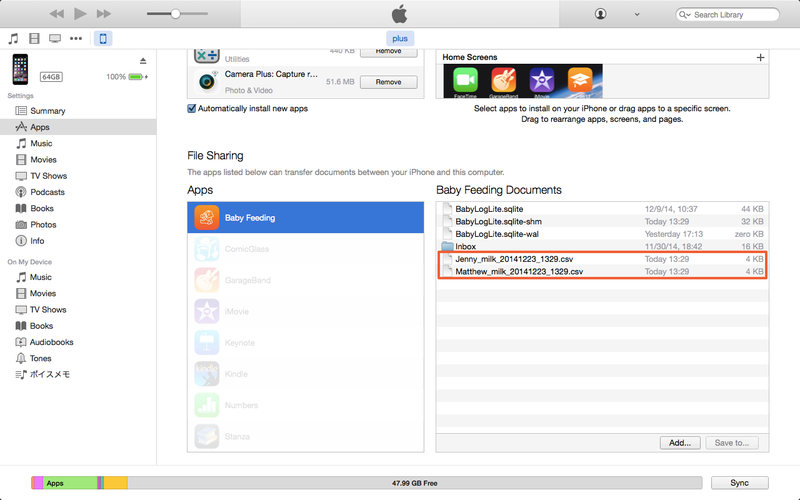 It’s possible to copy by connecting the iOS device to iTunes, selecting the simple baby feeding log with the file sharing function in the Apps screen, and then drag-and-drop through the document fields. For detailed instructions, please refer to Apple’s site below. 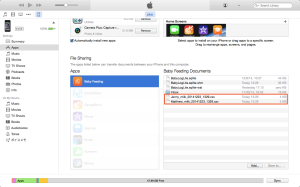 * You can receive file imports by email or other iOS applications, and you can also receive them by selecting the “Simple Baby feeding Log” from the data sharing list. Copyright (C) 2015 Little Grass Inc. All Rights Reserved.